October included our 35th wedding anniversary. To celebrate, we drove 90 minutes to the city of Dubuque, Iowa, on the Mississippi River. There we visited the Mines of Spain recreation area and National Mississippi River Museum and Aquarium. We enjoyed dinner that evening and an overnight stay at our favorite B&B in town. Dubuque, a city of about 58,000 residents and five colleges, sits on the banks of the Mississippi River, in the northeast part of Iowa. It’s one of the oldest permanent settlements of Europeans west of the great river, and the oldest one in Iowa itself. The original settlement dates from the 1780s, as a prime location with trapping and hunting, fishing, and logging. In addition, the area had long been a site for lead mining by the Mesquakie tribe, and later by white settlers. The city was chartered in 1837. You can see the evidence of its age in local architecture. Almost 5,000 properties are documented for historical and architectural significance. These include churches, former boarding houses, grand mansions, and shipyards. One shop in particular, the Iowa Iron Works, started as an iron foundry and machine shop in 1852. The site was responsible for building about 500 boats on the shore of the river. One of them was the Sprague, the largest paddle wheel steamboat on the river at 318 feet in 1901. The company reorganized in 1904 into the Dubuque Boat and Boiler Works. Many boats built by the company were for the government during World Wars I and II. The history of this region goes back a long time. Early Native American cultures dating back 8,000 years left evidence of mounds, villages, rock shelters, and campsites on the landscape. The Mesquakie traded furs with French voyagers and worked the lead mines in the bluffs along the river before the Revolutionary War. The first European to settle here was Julien Dubuque about 1785. He received a land grant from the Governor of Spain in 1796 giving him permission to work the land and mine for lead in an area named “Mines of Spain.” Dubuque married the daughter of the local Mesquakie Indian Chief. Dubuque died 24 March 1810. The Mesquakie buried him with honors at the site of the present monument on a bluff overlooking the region. The Mines of Spain park is now a favorite recreation spot for locals and visitors, alike. 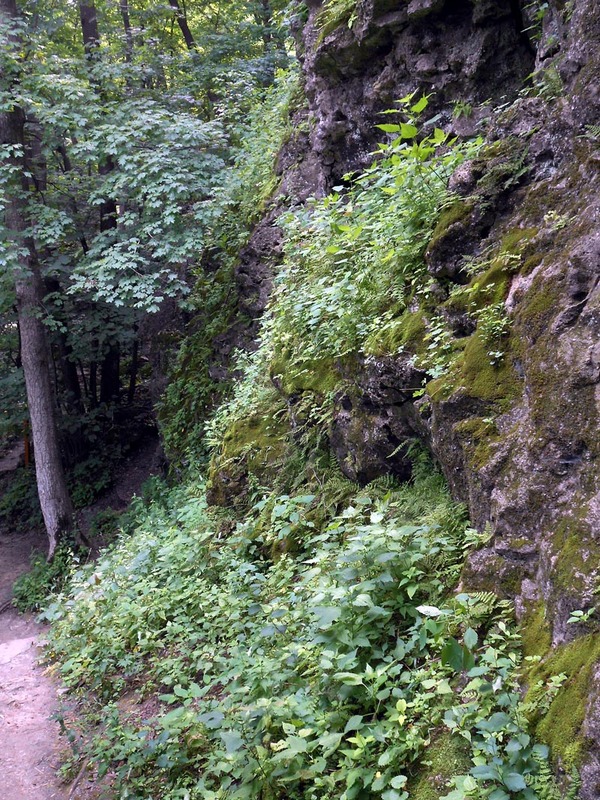 It features bluff-side trails, as is common with river parks in the Midwest. With both of us recovering from knee problems, we weren’t incredibly ambitious with our hiking. However, we did enjoy two different trails with a total distance of about three miles. Views of the river, seen from different overlooks on the trails, still include barges and riverboats, much as they did 150 years ago. The Mississippi River has a rich and colorful history. It touched the lives of many as it flowed from Minnesota to the Gulf of Mexico. Owned by the Dubuque County Historical Society, the museum is affiliated with the Smithsonian Institution. The museum features the culture and history of America’s rivers. There are over a dozen aquariums featuring river wildlife and animals found at the Gulf of Mexico. You can see giant blue and channel catfish, sturgeon, ducks, frogs, turtles, rays, octopus, river otters. Other exhibits include steam boilers, boats building hardware, and a woodworking shop. Children seemed excited to look through the clear tank walls and even had opportunities to touch some of the animals. We found it all very interesting. We headed back home the next day and stopped at a favorite nearby park. Palisades -Kepler State Park hugs the Cedar River. Bluff-side trails give opportunities for more challenging hiking, with lots of roots and rocks and ups and downs. We didn’t take photos this time. However, three years ago we did and shared them in this post. This entry was posted in Hiking, Outdoors, Travel and tagged Dubuque, Iowa, Mines of Spain, Museum, National Mississippi River Museum and Aquarium, Smithsonian, state park on October 25, 2016 by Jim R.
Last Friday we had time, opportunity, and weather for a perfect morning in Matthiessen State Park. Matthiessen is located in north central Illinois, very close to I-80. On Thursday evening we’d been in Sycamore, IL for my presentation to a quilt guild. On Friday we needed to head southward to my sister’s home. Matthiessen was right on the way. The skies were bright and dry with early fall crispness. Clouds of dust arose on both sides of the highways, stirred up by farmers harvesting corn and beans. As we approached the park, there was little evidence of it besides a stand of trees in the distance. Like so many midwestern parks, instead of rising above the surrounding landscape, Matthiessen’s best features are below, hidden from view until you are deep within. At the north end of the park are the dells trails around and through a water-eroded sandstone canyon. Reaching the upper trail requires descending a broad, stable stairway about five or six flights long, which some would find difficult. 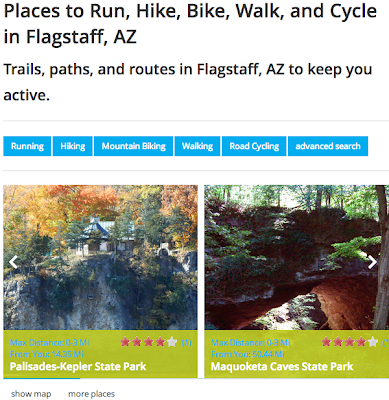 Once that far, the upper trail is a well-maintained loop and relatively easy for most hikers. There also are stairways into the canyon for those who are more adventurous. Depending on water levels, the lower trails can be off limits. For us, they were open, though deep mud prevented us from exploring all the crevices we wanted. In the pictures below, you can get a sense for the lower trail within the canyon. On the concrete stairway stands an older woman who generously gave me a mom hug. I had explained to her that I’d visited Matthiessen as a child, and that my mom had led those trips. That day also was my mom’s birthday, which made a poignant reminder for me. That’s me in the bright pink shirt. Below the staircase the canyon walls rose on both sides. A path allowed access both upstream and downstream of the stairs. Across from the stairs was a small stream, the seasonal remains of the eroding waterway. In the bowl, water has worn away caverns on the undersides of the walls. Kids enjoy exploring the small caves. Jim created a panorama of the canyon bowl. He is standing below the roof line of one of the caverns. And here is his video in the bowl. After we ascended the concrete stairway, Jim and I disagreed about the correct direction to take. Should we cross the bridge spanning the canyon, or go up farther to the trail from which we’d come? The quickest way to answer the question was to head up to the trail map at the top. We both climbed more stairs, up another five flights to check. And as it turns out, Jim was right! We wanted to cross the bridge below. A little farther along, we descended into the canyon again. This area was less used and it had more natural impediments. At one point we picked our way along a foot-wide ledge, avoiding tumbling into the bottom 12 feet below. Here we continued upward, climbing up through a series of stone ledges. After another section of stream bed hiking, we exited the bottom and returned to the upper trail. Matthiessen is a great park for families. With picnic areas above, a recreated French fort, easy to moderate trails, and fascinating geology, there’s something to please everyone. The park will always be on our list to return to. 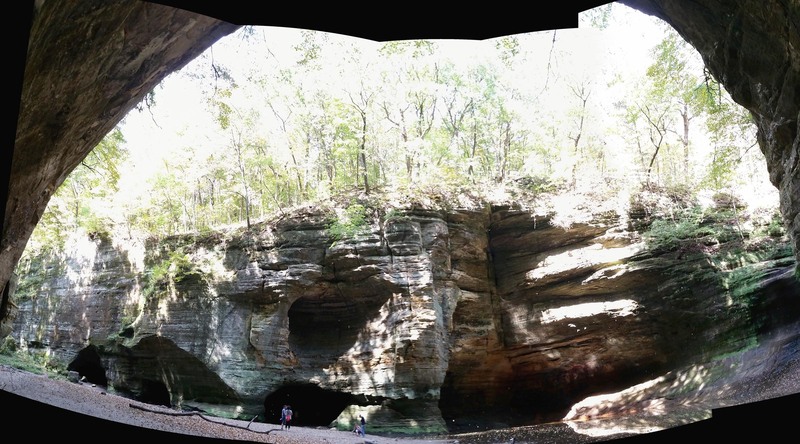 This entry was posted in Hiking, Nature, Outdoors, Photography and tagged Fun, geology, Hiking, Illinois, Matthiessen State Park, state park on October 1, 2015 by Melanie McNeil. We go to Palisades-Kepler State Park in east central Iowa several times a year. Thanks for joining us this time. We like to hike along the trail more than 100 ft above the Cedar River. Parts of the trail are along the face of these rocks. Each season brings out something different such as wild flowers in summer or colored leaves in autumn. 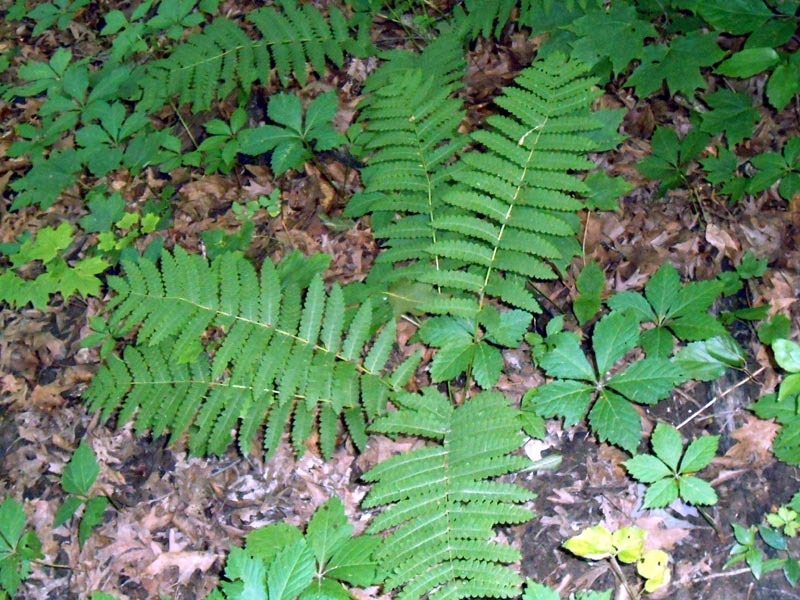 This time it was an abundance of ferns. We’ve had a wet and cool spring. This entry was posted in Iowa, Nature, Outdoors and tagged Exercise, Hiking, Photography, state park, Trail on July 6, 2015 by Jim R.
July 8, 2014 was our 34th anniversary of the day we met. To celebrate the occasion, we went to Wildcat Den State Park near Muscatine, IA. It had been many years since our last visit with our young son. He is all grown up now learning to fly for the Air Force. 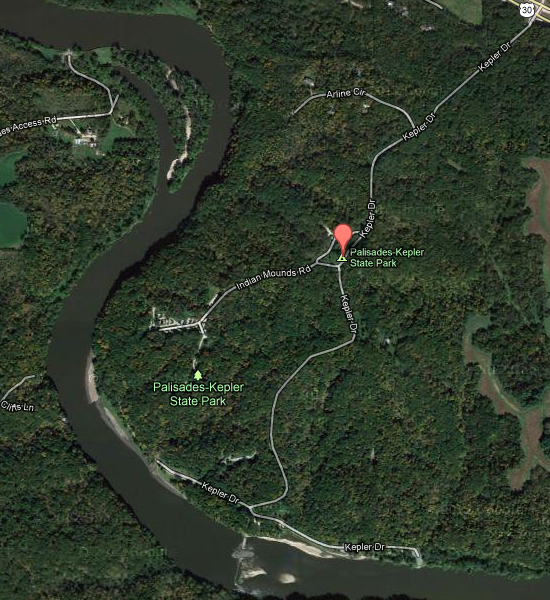 We drove the hour from home and entered the park from the north in this map view from Google. We parked the car at P and set out with our hiking poles. Light blue arrows show our route started out counter-clockwise around the big loop. Right off the bat we encountered some trouble. There was a giant tree across the path, downed by the heavy rain and softened soil from the week before. Fortunately it wasn’t a harbinger of things to come. Past the tree, the trail (marked with a yellow and red line) began with an uphill slope. It crossed the main road through the park and continued upward, finally flattening as we headed west. Show me the rest of the hike. This entry was posted in Hiking, Iowa, Outdoors, Photography and tagged anniversary, Grain mill, Hiking, Iowa, Muscatine, Outdoors, Photography, state park, Trail, Wildcat Den State Park on July 15, 2014 by Jim R.
The trail system isn’t extensive. The main trail is out and back, following the tree-lined east bluff of the Cedar River. The fossil-embedded rocks tower over the hiker at some points. At others, the hiker ascends the bluff to walk along the upper surface. There are plenty of roots and rocks, ups and downs, and terrific scenery to keep things interesting. It’s easy to get caught up in the bigger scale. But interesting things appear when you pay attention to the small, too. The grey limestone cliffs host plants growing in unexpected places. Ferns of all sizes, mosses, and wildflowers thrust from the stone. Columbines seemed to thrive on the rock face. Jack-in-the-pulpits and shooting stars rose up, scattered throughout the park. As we headed out, we saw this slope covered with wild geraniums. We left the park and headed toward home. About halfway is the town of Solon. Lucky for us, the volunteer firefighters were holding their 51st annual breakfast to raise funds for the fire station. Abundant plates full of pancakes, eggs, and sausage or ham, as well as hot coffee, helped refill us after our hike. The breakfast was serendipity this year, as we hadn’t known it was being held that day. But it’s already on our calendar for next year! This entry was posted in Hiking, Iowa, Nature, Outdoors and tagged Cedar River, Hiking, Iowa, Photography, state park, Trees, Wildflowers on June 14, 2014 by Melanie McNeil. Drive 45 minutes west of Enid, OK and you reach the Glass Mountains State Park. It is small, only 640 acres (1 mi2). Sometimes referred to as the Gloss Hills, their name comes from the sheen and sparkle of selenite crystals, or gypsum. The tops of the mesas are thick with them and appear light gray and green. There are also thin layers of selenite in the red dirt of the Permian soil in these “Shining Mountains”. Click this Google Maps image to do some exploring. Light gray areas are tops of 150 ft high mesas. At the lower left of the map is a turnout from highway 412 into a parking lot. From there, you can take the trail up the steep 150 foot climb to the top of the largest mesa. This entry was posted in Hiking, Outdoors and tagged geology, Mountains, Nature, Oklahoma, Photography, Recreation, state park, Travel on April 7, 2014 by Jim R.
After our visit in West Virginia with a daughter and her family, we headed west toward home. At the end of day one of our drive, we stayed overnight in Logan, OH. 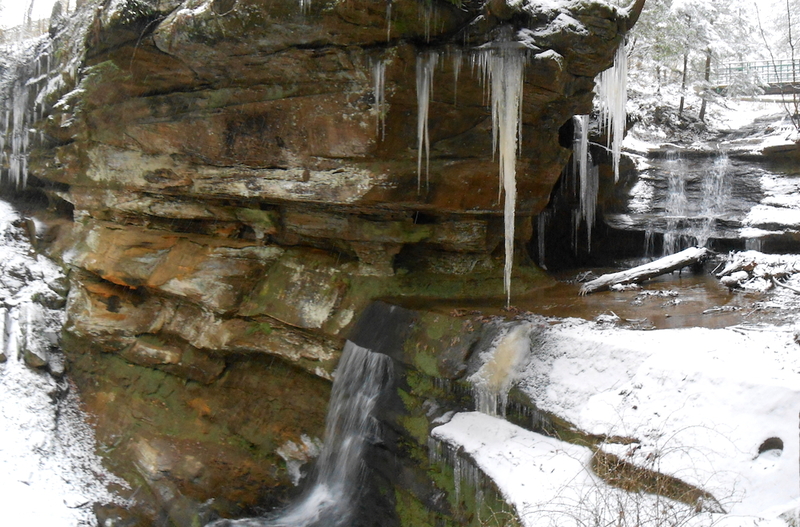 It is near Hocking Hills State Park. The next morning we planned to hike a couple of trails in that park before continuing our drive toward Iowa. Overnight a light snow had fallen. The car needed to be brushed off. We drove out of Logan on a snow-covered county road about 10 miles southwest. At the park headquarters, we parked next to the only other car in the lot. The driver said he had been here many times. He was getting his camera gear ready. We asked his advice on the trail we were going to take to Old Man’s Cave before we departed in opposite directions. 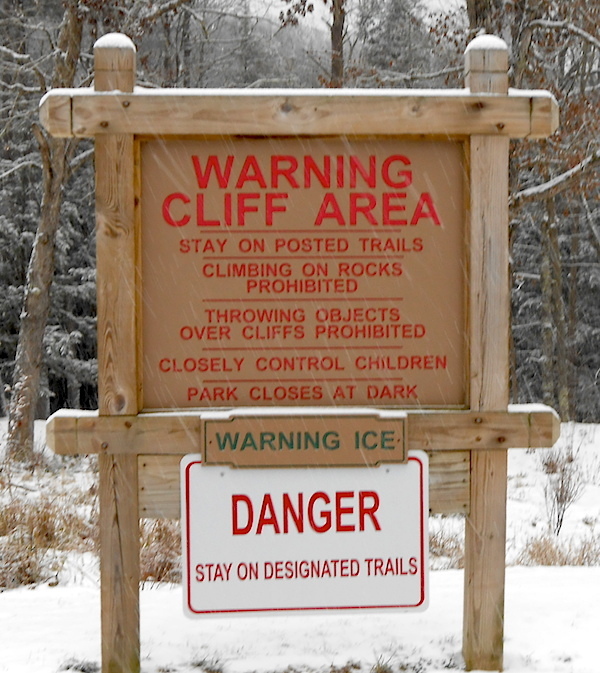 Signs were posted about the dangers of ice and falls in the park. This was going to be a little more challenging than we originally thought. Our plan was to visit the headquarters, view a map, and use the restrooms. The building was closed. A map was posted on the door. Portable toilets were available nearby. The snow was falling steadily, but still light. We went down the stairs toward the deep gorge visible at the bottom. Part way down we stopped to take in the view and talk about safely walking on snow-covered icy trails and stone steps. The trail went farther into the gorge. A sign gave us the choice of going upstream or down. We headed downstream toward Old Man’s Cave. The cave seemed to be lit, giving an other-worldly glow. The source was the opening above, the grey winter light brightening even under the rock ledge. This is interesting. Show me more. 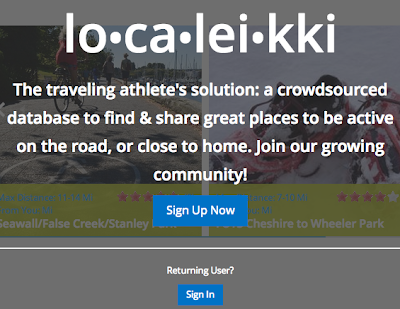 This entry was posted in Hiking, Nature, Outdoors and tagged Cave, Hiking, Hocking Hills, Hocking Hills State Park, Logan Ohio, Ohio, Photography, Recreation, state park, Trail on December 21, 2013 by Jim R.
As with most people, a lot of things are pulling us several directions. We said ‘No’ to the outside forces recently and made our escape to Kepler-Palisades State Park. 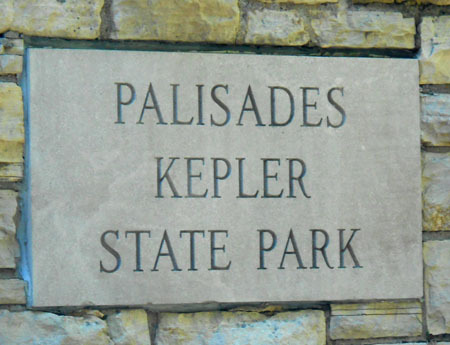 Kepler-Palisades is one of the Iowa state parks near us. It is east of Cedar Rapids, just off of U.S. 30, Lincoln Highway. The Cedar River cuts through some coral beds as it makes its way southeast toward a union with the Iowa River, before joining the Mississippi. We entered the park off Hwy. 30 on Kepler Drive. At the ‘T’ near the river, we turned right. Left of the red marker at the river, you can see some shadows cast onto the water. The shadows are from a high cliff face, or palisades, and the trail follows it for quite a distance. From the main trail head, the trail begins flat and fairly smooth. Quickly the hiker has to decide whether to take a “high road” or a “low road.” They both end up at the same place, a compass pavilion near the high point of the park. Rocks and roots make watching your feet important. Past the pavilion, the trail becomes a lot more interesting and a little more difficult with more elevation changes and trickier footing. Even so, on the trail there is little danger other than a sprained ankle or scuffed knee. Off trail, it is dangerous with loose rocks, particularly on the river side. Some adventurous people get permission at the park office to do some climbing and rappelling. Over the years, multiple people have fallen to their death after wandering off the trail. We noticed more railing and signs had been added pointing out the dangers. At the bottom of the overview picture is a run-down dam. The very low water levels from the dry season we’ve had make it possible to walk around the area now. Below you can see the stairway to the dam. The passage at the bottom is barely wide enough to fit an adult. Come for more walk in the park. This entry was posted in Environment, Hiking, Iowa, Nature, Outdoors and tagged Cedar River, Hiking, Iowa, Iowa River, state park, Trees on October 21, 2013 by Jim R.